Discovering a solar system in a grain of sand. It takes only about three million years. That’s the gestation period of a solar system: three million years for a star to form from an immense cloud of gas that spirals inward, leaving behind the molecules of silicates and metals that will coalesce into planets. That may sound like a long time, but building the foundation of a solar system is a big job; scientists have been trying to understand why it doesn’t take longer than three million years. Last November astronomers announced that they have found evidence to support one explanation of how this process was helped along by analyzing a meteorite that is older than the planets themselves. The result doesn’t say precisely what magnetic effects cause the acceleration of gas toward the central star, but it does establish that magnetic fields were most likely the dominant mode of transport. “There are models based on nonmagnetic effects,” says Fu. “For example, the baroclinic instability is something people talk about.” That instability is a concept in fluid dynamics based on the idea that temperature variations cause turbulence. The measurements are astounding for a number of reasons: first, because they are made on such a small scale. Using a very sensitive magnetometer that relies on superconductivity, Fu and fellow researchers measured the magnetic fields of the meteorite’s chondrules, molten droplets in the primordial gas cloud that hardened into stony rubble and, through cycles of heating and cooling, gathered into meteorites. Then Fu went even smaller. The grains get magnetized when they’re exposed to a magnetic field, and if they cool”— below a certain, still very high temperature—“they remain magnetized.” The grains in the Semarkona meteorite have kept this magnetization for billions of years. “That’s a magnet that lasts,” says Desch. “And they’re each like little bar magnets.” In other words, the direction of the polarization can be determined: which end is positive, which is negative. 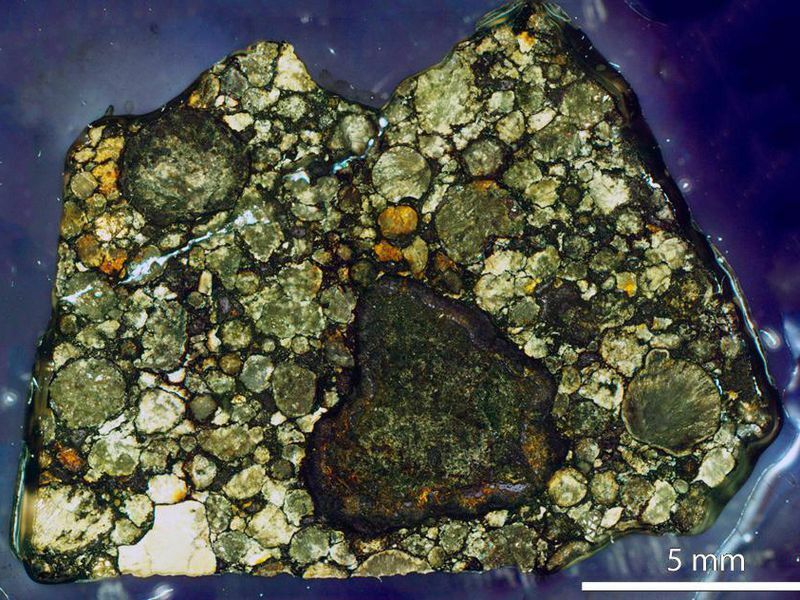 “The really cool thing,” Desch continues, “is that in each chondrule, the magnetic fields recorded by these iron-nickel inclusions have a uniform direction, but one chondrule’s field points in a different direction from another. They all go in different directions. That tells you they were magnetized before they grouped into this [meteorite].” And the magnetic field that magnetized them, therefore, existed when they were floating as droplets in the gas that formed the solar system. Based on their measurements and calculations, Fu and the researchers determined that the infant solar system had a magnetic field roughly equal to what a hiker’s compass detects today, so, according to Desch, the ancient magnetic field that existed before Earth became a planet is comparable to the magnetic field on Earth today.